Red Dragon писал(а): А это не банеры из предзаказа новой игры с кикстартера? Это фотка из твиттера, кто-то хвастался что он получил за вклад на кикстартере. Дымчатый ягуар сражается подобно воину. Никакого обмана, никаких сомнений - только яростное нападение, открытое и смертоносное. Harley Rassor is a simple farm boy in a complex techno-universe—more than happy to work the land of planet Slewis with his father. His restless older brother left to join the elite mercenary corps, Able’s Aces… and paid with his life. Now, Harley’s father wants him to join the fight—and learn what happened to his brother. What he learns is that the Aces are in turmoil. His instructor—tough-as-nails Lieutenant Livia Hawke—also happens to be his brother’s ex-lover. Rumors of suspected payoffs and setups are commonplace. And the entire unit is in danger of being disbanded. "Ильклан" отменяется, следующие пару лет у нас будет Ваха30к 1, 2 и 3 наследные войны + спорадические е-буки ни о чем от фанатов-графоманов. Well What is in the Que to come out...or is still in production. No real update per se. We've got everything except for rules and fiction completed and under development/management review. Phil A. Lee and I have been discussing the fictions bits. We've got art notes for the cover and are in the process of assigning it, no interior arts note as of yet. Иглесиас и шиммеринг сворд на мехаконе16, разговаривают о мехах. Diesel online. Hatches open. Weapons online. Сегодня приснилось страшное. Реально, сцуко, страшное, аж проснулся: На "Малиновке" останавливал прущий вдоль реки от коровников "Маус" на Т-34-AC/20. Что за луна у ягуаров???? 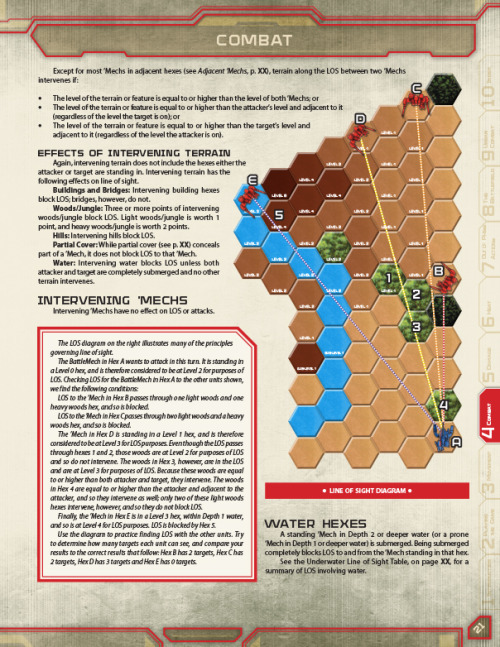 At MechCon 2016 I showed off layout samples of the coming BattleMech Manual, and mentioned I’d be sharing them online…. 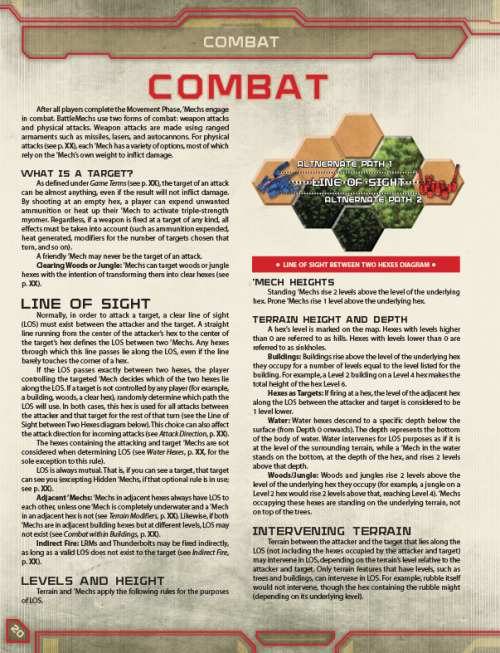 Here are several pages from the Combat chapter of the BattleMech Manual (as you can see from the “p. XXs” still in the body of the text, this is a pre-final). The first page above gives you a good look at the colors and graphic style of this new layout, along with the look for the diagrams. This next page brings a few other items into the mix. First, it showcases how only the tab for the current section is highlighted along the edge of the page, with the rest subdued (please note the chapters for inclusion are not finalized, so the tabs will be changing). Additionally, you’ll note that the example is completely off in its own box. This means it’s not inserted into the middle of any text–as all previous rulebooks have done–so that a player can ignore it if it’s not needed. Yet it’s there if it is (though there’s fewer over-all examples in this book than TW). This next page showcases one of the things I’m most excited about. As I previously mentioned we took the text of the book and ran it through the filter of our demo agents. An exercise in tapping their expertise to better present the information in easier to understand ways. GATOR is a direct result, as well as the “Strategic sidebar”; i.e. not sidebars of examples or rules, but of better ways to learn and play the game. Then Ray did a fantastic job of wedding that concept to the visuals you can see below that sidebar in the headers of the text, calling out the modifiers that apply to each letter of that GATOR acronym. 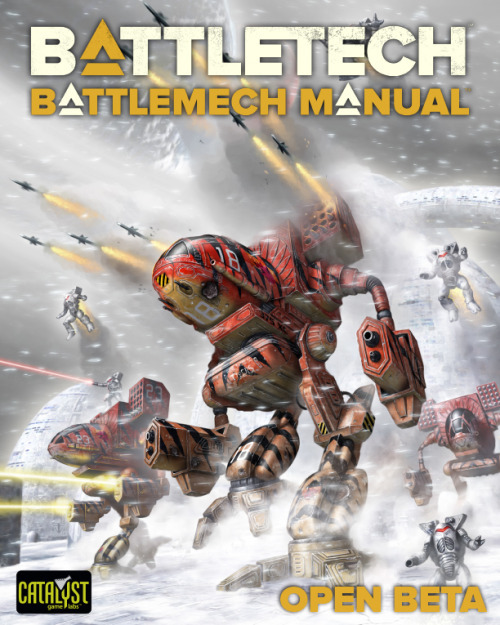 So that while, yes, the text of the BattleMech Manual can be thought of as a “filter” with “only BattleMechs” applied to the Total Warfare text, we’ve spent a huge amount of work to re-work and re-present it all in thoughtful, new ways to aid in learning and use. Finally, for this post, the last page I’m showing. Another angle where we’re listening to players and our demo agents, is trying to expand diagrams where appropriate. Every single previous BattleTech rulebook included a small “Firing Arcs Diagram” and then tried to explain how it worked in the text. And despite good text, it’s simply a complicated situation that often resulted in confusion among even long-time players. As such, the above, much expanded diagram, to really drive home exactly how such rules work. Through five rulebooks across twenty years the general organization and presentation of material remained pretty consistent. In Total Warfare I made some pretty radical decisions concerning that presentation and organization. While in some ways we’re reverting portions of the organization back to previous rulebook styles, in others, we’re actually pushing it in all new directions. i.e. Total Warfare let us know we could break with past history if we felt it would make the book better. 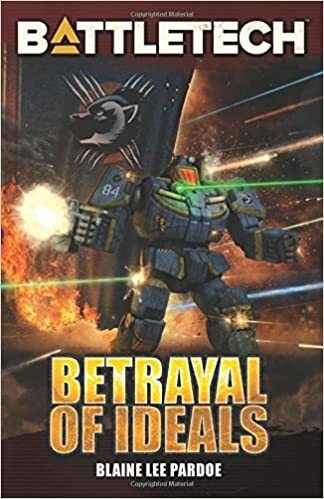 In this instance, a few key decisions were made that really push that boundary of what BattleTech players have come to expect from a rulebook. 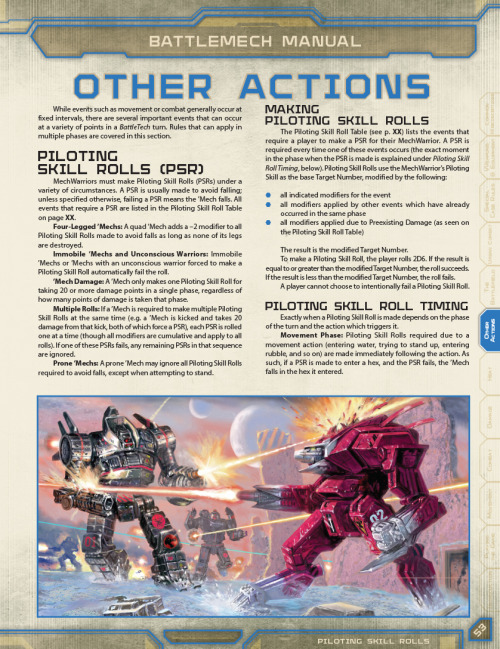 One of the bigger breaks was to pull Piloting Skill Rolls out of Movement and place it (along with a few other rules, such as Displacement and Falling) into a brand new chapter, Other Actions. Keith originally suggested this and obviously I was reticent. But after discussing it and pondering, it made good sense. PSRs fall into a strange category in that they can happen almost anytime across all phases of a turn. So just placing them the first time they might come up is slightly arbitrary. What’s more, you could play numerous turns in a game and never once run into PSRs. As such, giving them their own focused chapter felt appropriate. The next big organization change was another Keith suggestion (what a great experience this was going round and round with Keith, Ray and Mary as we really refined elements of the book). This time, it was about putting Damage into its own chapter. Even more than PSRs I initially balked. However, in Total Warfare the Combat chapter was huge: 55 pages. And even pulling out non-BattleMech elements still left this chapter really large. 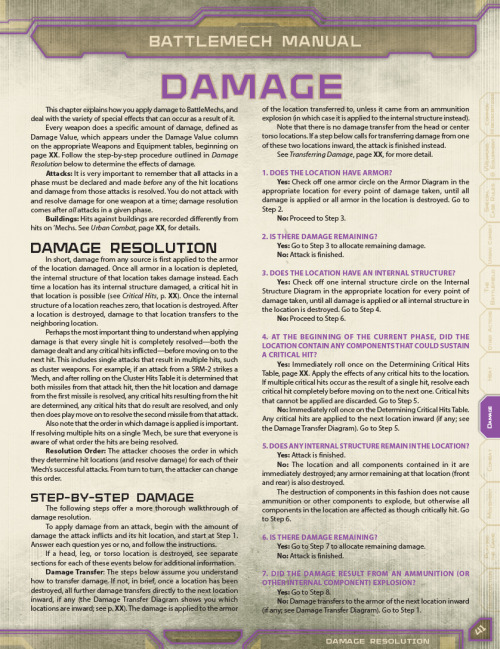 To help pull the chapter down in size, as well as create a more focused “Looking for how Damage works? Go to the Damage chapter,” it also felt logical to follow this path. The last decision surrounding bringing the size of this chapter down further–and continuing that thread of more focus within rules sections–Weapons and Equipment are now found in their own chapter. Additionally, the tables of those equipment have been returned to previous rulebook styles in that they contain construction and game play data all in one spot. One of the few true reversions to those early organizations that makes perfect sense for this book. Ultimately, as always, you the community will let us know if all this work makes your games easier to run and more enjoyable to play. 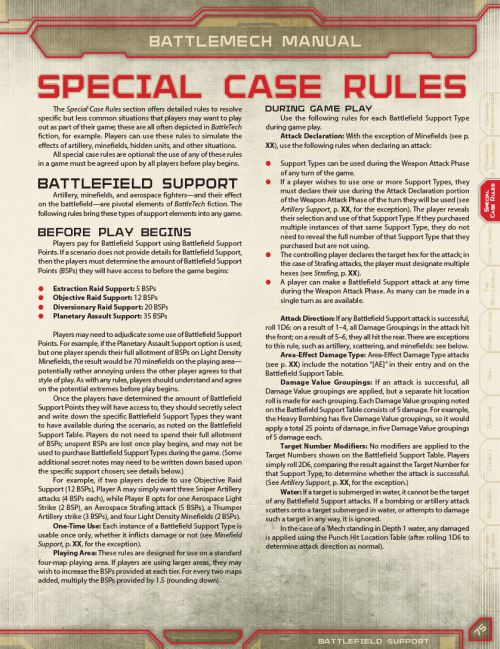 Next week I’ll talk about a whole new subset of rules in Battlefield Support (found in the Special Case Rules chapter) and how that–in a very late-game turn-of-events–developed into one of my favorite elements of the BattleMech Manual. As promised last week, this time it’s about Battlefield Support. We went into this project thinking there weren’t any new rules to create or publish in this book. However, as we dug in, I realized that there’s a lot of the community–including myself–that enjoys bringing artillery, minefields and even aerospace elements into the BattleTech game, but we want it in a nice, small dose. And there’s been a myriad scenarios in various packs over the years that have done just that. But each time it’s a different system and sometimes it works, sometimes it doesn’t. With that in mind, I started creating rules that would allow players to do exactly that. Select some elements of those other parts of the universe that often are so crucial to the fiction, but self-contained, relatively easy to use, and all based upon a unified system. I sent out the first draft for a review and quickly found issues. Generated a second draft and sent it out for review. And one of the playtesters had a great suggestion for “defensive” air cover (I’d only been concentrating on “offensive” air cover), so drafted that and folded it in and sent it out for review again. And then based upon Ray’s comments Keith re-ran all of the math as a back-up to mine and brought it further into line as it had a final review. What ultimately came out of that is a really great set of rules that should fit all the criteria noted above: be self-contained, allow for some battlefield secrecy, flexibility of building your scenario, while all simple enough to just bring in that nice flavor without being too powerful or filled with rules bloat. 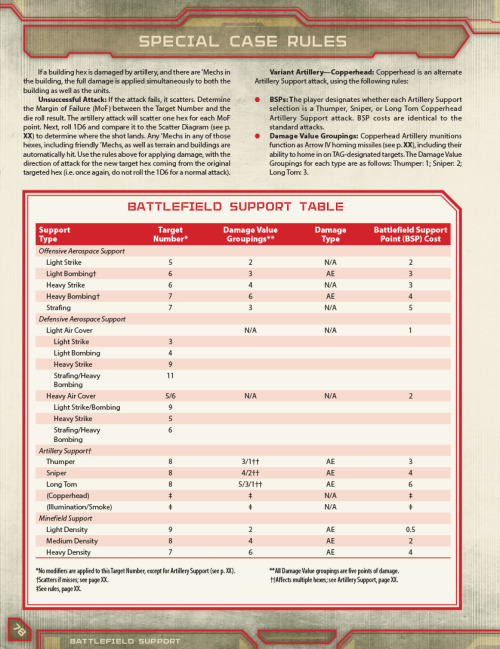 Here’s two pages from that section, the general rules that apply to all of the Support Types, along with the table that coincides with all of the Battlefield Support rules. As usual, once it’s out and you’re using ‘em, you’ll let us know how we did. Finally, a holiday gift from MechWarrior Online! This Gift Code Expires Jan 3rd, 2017. Однако, как мимо кассы прошло, что на амазоне появились папирбаки. 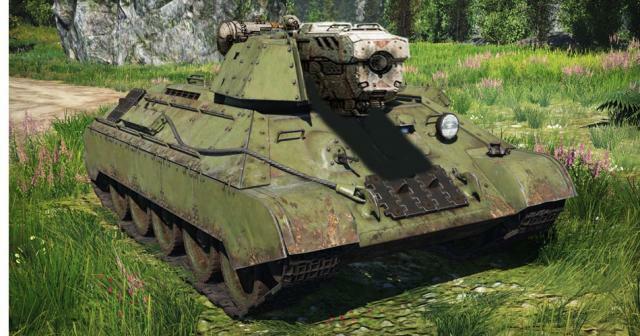 Ура товарищи! Надеюсь, хомячки получат НОВЫЕ дозы, а не хорошо забытые старые. 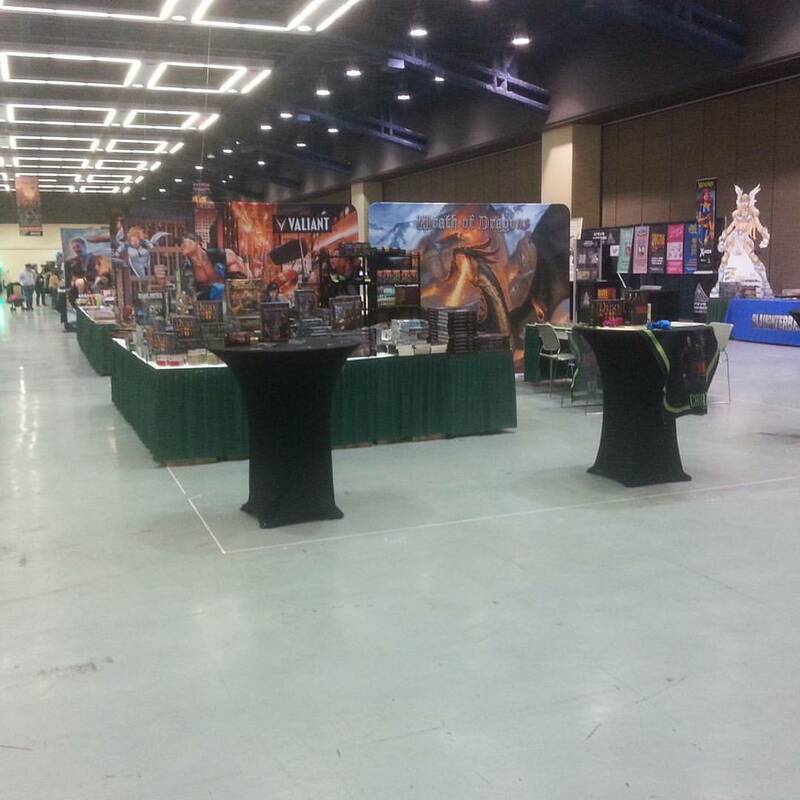 If you are Emerald City Comicon, stop at booth 801 for all your Catalyst action! We try to make the best possible product within the constraints placed on us (far and away the biggest one being time). At the same time, you just have to resign yourself to the fact that you’ll never catch every last problem. No matter how many times you read the text, it can’t compare with hundreds or thousands of fresh eyes going over it. This is where the internet comes in. In ye olde days, you took in the feedback from your few playtest groups, put out your final release, and hoped for the best. 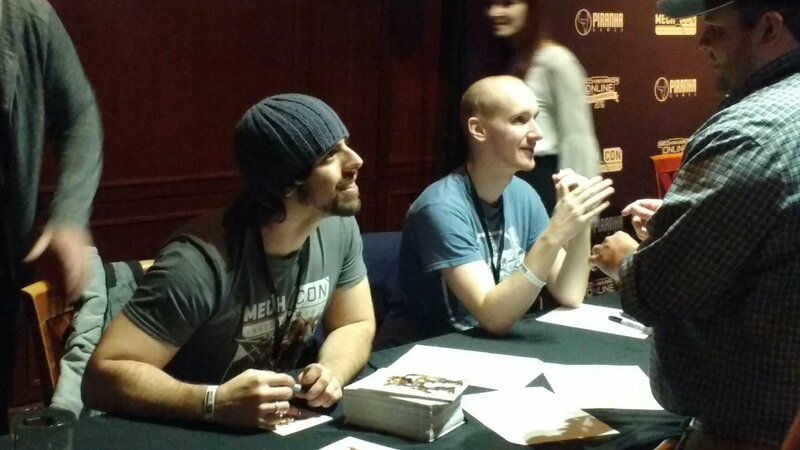 After that point you could only wait to see who would write you letters or speak to you at cons and point out the things you’d goofed on. Now we can reach so many more people, so that the final product is better and any eventual errata file is shorter (you’re still not going to get everything, though). Everyone wins. Along those lines, the beta period for the upcoming BattleMech Manual was very fruitful. We have nearly 200 changes, ranging from “replace this capital W with a lower-case w” to “replace this entire page with the following new text” (I’m particularly happy with how the thorny issue of displacement was dealt with). Overall, the book will be better than ever due to your feedback, and we thank you for that. One particular bit of feedback noted something we hadn’t considered much at all, however. The original idea for the book was a strictly Tournament Legal volume (using the formal definition in BT). As time went by, the scope of the book changed and we abandoned the idea of worrying about rules levels in the Manual. However, the list of what equipment was to be in the book still reflected that Tournament Legal mindset: only TL-rated items made the cut. 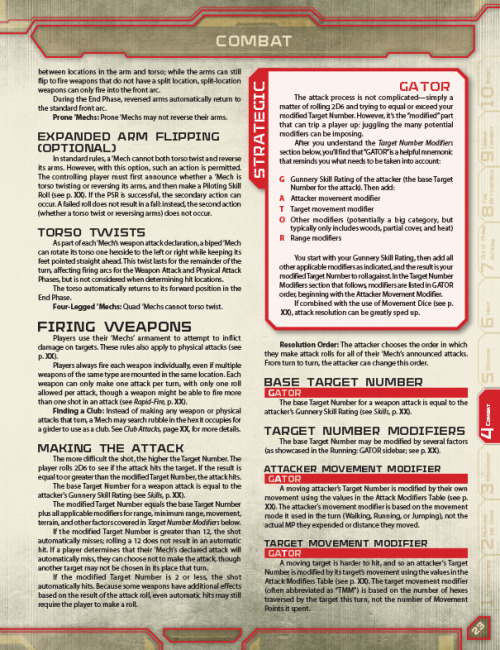 The most recent Technical Readouts – Prototypes, 3145, and 3150 – wholeheartedly embraced the host of new weapons and equipment in use in BattleTech since Tactical Operations appeared. The ’Mechs in those volumes really push the envelope in terms of equipment options. However, a lot of that gear isn’t rated as Tournament Legal. 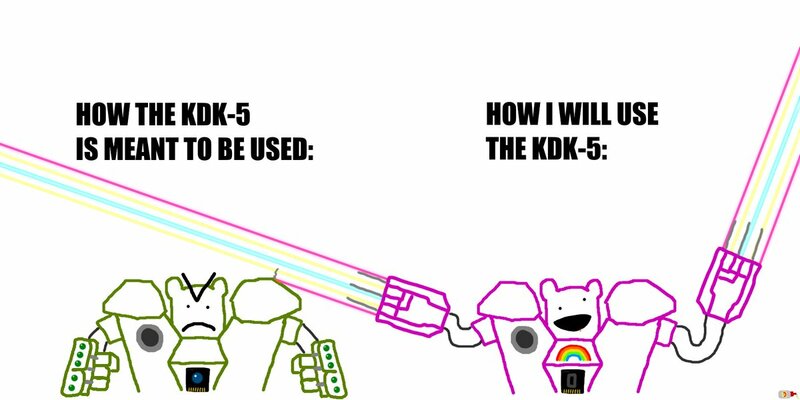 The result was that many of the machines in those Technical Readouts weren’t 100% supported by the BattleMech Manual. Now, as we’ve said from the beginning, the Manual was never intended to cover everything (“90% of stuff used by 90% of players”, was the mantra). A lot of the equipment on the machines in those three Readouts pretty much only appears there; it’s niche. But as time goes by and the BattleTech timeline marches ever onwards, it becomes an ever-larger niche, and by lacking a lot of that equipment, we were letting our post-Jihad playerbase down. So, even though these items aren’t in use by a large number of ’Mechs to date, we realized we need to add some of them to the Manual. But what to add? Of the 122 ’Mechs in the three Technical Readouts under discussion, 73 aren’t 100% usable by the Manual beta (sometimes this is just one item, sometimes not). The problem is that those 73 ’Mechs are that way because of 38 different pieces of technology. A lot of those 38 pieces might only show up on two or three ’Mechs, or even just one (Blue Shield PFD only on the Quasimodo, mining drill only on the Violator: I’m looking at you guys). 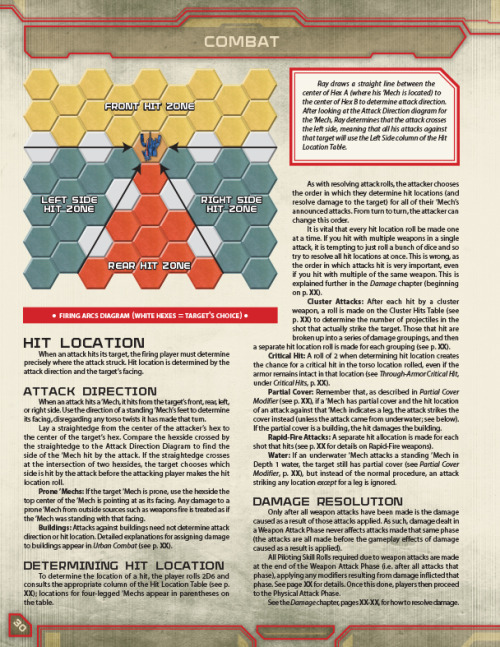 Some of those pieces require a lot of rules text to describe how they function (handheld weapons and remote sensors each require an entire page). Adding all that would bloat the Manual–the exact thing we designed it to avoid. Thanks again everyone for your feedback! Во всем, что касается танков, баттлмех манул занимает позицию: "Танки? Не, не слышал". Рэй Аррастиа писал(а): Just a brief update to spill about the Turning Points currently in the pipeline (these are somewhere between development (past the pitch stage) and layout). They span from the Second Succession War/Golden Century through the early Republic eras. Судя по всему, обложка для грядущего ilClan: Девлин Стоун триалится с Алариком Уордом в испытании владения за Терру. Стоун? Он же на пенсии. — сколько процентов от победы составляет удача? ELH_Doppelganger, он живее всех живых, наша сила, знамя и оружие. ELH_Doppelganger писал(а): Стоун? Он же на пенсии. Его с пенсии почти насильно вернул Такер Харуэлл. Последний раз редактировалось Rabid Coyote 02 июн 2017, 17:25, всего редактировалось 1 раз.